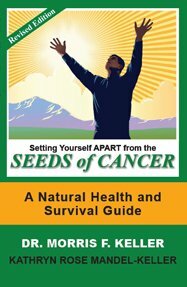 Cancer prevention and the elimination of nearly all illness are possible with natural techniques, a healthy lifestyle and partnering with God. God created our amazing and complex bodies to be self-healing provided we do nothing to interfere with this natural process and do everything instead to promote healthy cells needed for growth and repair. in this must-read book about staying healthy—physically, emotionally, mentally, and spiritually. You too, can prevent cancer. Dr. Keller—having survived colon/pancreatic cancer using only natural methods—was shown a new path and purpose for his life in serving God by teaching others time-tested and learned principles and techniques for cancer prevention and healthful living. Tracking a spiritual journey and a personal journey from Cancer to Wellness, Keller emphasizes the need to revert to biblical truth and to be in partnership with God. A culmination of his seventy-two years of experience, Dr. Keller poses a challenge to readers to re-evaluate their own lives and be willing to change in order to prevent cancer from spreading—to improve their own health, the health of society and of this planet. Cancer prevention is more than skin deep—it's seeds are all around us and we need to curtail it's pervasive quality from attacking our hearts and minds as well as our physical bodies. “We can all make a difference in cancer prevention”, says Dr. Keller. "My purpose is to teach others how to prevent cancer and cleanse their bodies of illness. I tell the story of how other researchers and Doctors—Kelley, Gerson, Jenson and Reams—paved the way for me with proven protocols used in my recovery from colon/pancreatic cancer." Health and Survival Guide reveals how Western lifestyles, industrial and agricultural practices influence our health. Both anecdotal and instructional, readers will see the sound reasoning behind and the details for doing a complete body cleansing program, for making healthier choices in life, and for leading by example to help improve the lives of others. Biblical truth paves the way for cancer prevention. READER ADVISORY: Please note that this version does not allow you to navigate via the Table of Contents. We recommend that you read through the book in its entirety and then seek to review individual sections. There is a wealth of information which can be accessed by using the Index in the back as well as the Table of Contents and by referring to the actual printed page numbers and ADD 20 to locate a topic of interest using the slide bar at the bottom of your Kindle screen. Then you should BOOKMARK the location for future reference. This Kindle book was produced using a "fixed format" due to its complexity of content which would not format properly otherwise. Download a sample to test on your device. Born, raised and educated in America, Dr. Keller and his wife and co-author, Kathryn Rose Mandel-Keller, contributed ten years of their time and energy educating others in the country of Belize. Now residing in Kingston, Jamaica, they plan to continue their efforts to help to improve peoples lives. They chart a clear course for healthful living that anyone can follow in their book which also reflects Dr. Keller’s diverse life experiences: first as a student, then as a physician/surgeon, a cancer survivor, nutritional coach, chef, artisan baker, organic farmer and teacher. Kathryn—more often referred to as Rose—has a Masters Degree in Art/Education and has put into practice over the past eighteen years all that her husband teaches. Together, the Kellers continue to coach students and present a free Natural Health Seminar called “Taking Care of God’s Temple” at synagogues, churches or organizations. and we will send you a PayPal Invoice for the number of books ordered. There is a $1.00 charge for each additional book shipped. If you prefer to INSURE and TRACK your order (No P.O.Box Please) an additional $5.00 will be added to the total for shipping within the continental U.S. only ($1.50 handling charge goes to our shipper). Upon full payment, your order will immediately be placed with our supplier either in the U.S. or the U.K. and shipped directly to you. Simply Contact Us for shipping cost for outside of the U.S.
Get your Natural Health and Survival Guide today.